George Edwin William Monk, best known as Ed Monk, was born on Bainbridge Island, Jan 1, 1894. He was both a shipwright and naval architect and wrote two well-known books on boat building: Small Boat Building (1934, revised 1947) and Modern Boat Building (1939, revised 1949 and 1973). 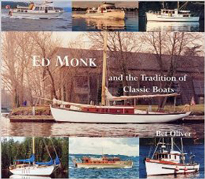 For more information on this author go to http://en.wikipedia.org/wiki/Ed_Monk or to Bet Oliver's book Ed Monk and the Tradition of Classic Boats. Oliver's book is part of the Bainbridge Public Library collection.